The latest releases of the ISM Manufacturing and ISM Non-Manufacturing reports for the month of January show what appears to be a rapidly declining inflation picture. 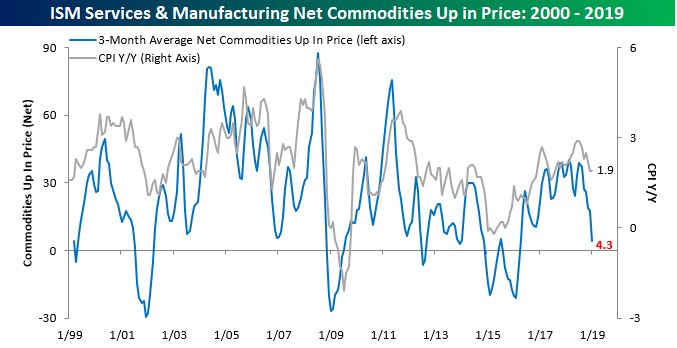 In each month’s ISM report, respondents are asked which commodities have been rising and falling in prices. In this month’s survey for the Manufacturing sector, respondents noted price increases in 11 commodities and declines in 15. In the case of rising prices, this was tied for the lowest reading since August 2016, while the number of commodities falling in price was the highest since February 2016. On a net basis, the reading of -4 for the number of commodities rising in price was also the lowest since February 2016. For the Non-Manufacturing sector, it was a similar trend with just five commodities rising in price and six falling in price. That net reading of -1 was the lowest since February 2016. Combining the results of both of these surveys together, during the month of January businesses in the Manufacturing and Services sectors noted price increases in 16 commodities and declines in 21 for a net reading of-5. The last time this reading was lower was also in February 2016. The chart below shows the three-month moving average of the net total number of commodities rising in price compared to the y/y change in CPI. Looking at the trends in both series over time, they have tended to track each other pretty closely, and in many cases, big swings in the results of the commodities survey actually preceded big moves in y/y CPI. Looking at recent moves, in the last few months, we have seen a sharp decline in the net number of commodities rising in prices from a near multi-year high of 38.7 last July to the current level of 4.3 now. During that time, CPI has also declined from 2.9% last July (highest since 2012) to 1.9% now. Based on the sharp drop in the number of commodities rising in price recently, CPI likely has further to drop as well. This should help give the Fed more cover to remain dovish.